thanks for this — I’ve been baking sourdough for about a year and a half now, and black sesame bread is gorgeous, so I’d like to try it. The weather really makes a difference in how “pretty” my loaves are. They always taste good, but if it’s too cold, the yeast gets unhappy. Yes, it is interesting that the taste is always quite good, even with the pancake-beings. Well, I hope you’ve never had one of those, though! We all have ups and downs in the kitchen. That is normal… Your sesame bread looks amazing and really tempting. Good to see that your baking mojo is back! I’ve had some ups and downs before, but a stretch of weeks and weeks of so-so bread was hard to take! 😉 Good to be back! Yaay, she’s back! It may be an ambient temperature issue – over here, if I leave the starter on the bench, it’s too sour to use within a few days. We’ve been keeping ours in the fridge for seven years now, and when it gets sluggish, I do as you did and toss most of it and start feeding it afresh with small regular feeds. And for some reason, my starter won’t freeze, the three or four times I’ve tried, it’s just turned up its heels and died! It works well if I dehydrate it as back-up though! The loaves look beautiful. Glad to hear you didn’t give up! Breads can be very challenging. My husband who makes all of our bread had a terrible bread day recently…nothing worked. Ups and downs are a part of cooking and baking! Will be trying that black sesame loaf. I am a Dan fan and have learned alot from the Tartine book too, but have heaps to learn and practise. Oh my goodness Sally! What a lovely story of redemption! My heart was breaking with you…and then to see the end result? Joy! This looks just lovely. I’m so glad they were able to revive your starter! I am so glad my bread baking is back to normal, it was soooooo frustrating! I have just had breakfast but I am ready to have a big slice of this golden, crusty sourdough…It looks quite inviting, Sally! I find it hard to believe you were having trouble. You seem such a natural with bread. But it is a tricky thing. Looks like you’re back in the game. Yes I have been there before, unfortunately your post come a little too late :(. Back then I was too unresourceful about it. Luckily, I have friend that I gave some my wild yeast 5 yrs ago, so I asked to give to share hers. She gave me a 1/4 cup of it, and I start to feed it. Funny enough, now she said that hers is dying. So, she I’ll be giving her a portion as soon as she back from her vacation. What a bliss to know that you and your wild yeast finally revive :). But still, Phil need to go home soon, so that he can see how cheerful your face is right now :). She is a QUEEN of baking, not only bread but all kinds of amazing concoctions, and her photography is amazing! make-up at the undertaker’s??? You crack me up!!!! That is one beautiful bread. It makes me want to get back into sourdough. My husband quit eating bread and so I do very little bread baking any more…..
Dan Jr. is still behaving but he is getting pretty old so the sourdough spa treatment begins today. I just started a rye bread (commercial yeast) for bacon and tomato sandwiches for dinner tomorrow. I opened a new 500g bag of organic rye flour and noticed the use by date is next month. Destiny. Like you, I could never toss Dan Jr. He was a gift from my bread guru and very dear friend and has great sentimental value. I’m interested to hear that Dan can live on the counter for a week before being refreshed. If I understand the instructions, you are not feeding during that week – correct? Also, is the weekly refreshment with rye or AP flour? My sourdough mentor is back and I couldn’t be happier! I know what you mean about getting attached to your starter and its only been a few months since I started mine. I tried drying part of my starter for back up but now I need to freeze some using your post here. Cant wait to try this black sesame bread. 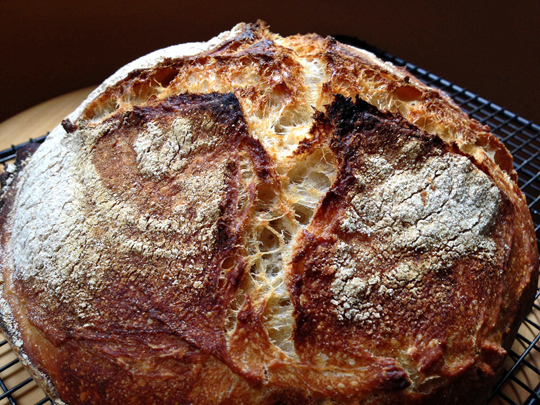 After making so many of your sourdough breads I just know I will LOVE this one. Whew! I’m so glad you are BACK in business! And black sesame seeds in your bread?!? Love it. The sesame seeds give this bread a completely different taste – going a bit in the direction of hummus… loved it! Oh, you got the bread proofing box! You will love it, not only to rise the bread, but also the starter in case your kitchen is a bit on the cool side… looking forward to your adventures with it! Nice to have you here, I love Joanne’s blog! I can only begin to imagine your frustration Sally! I would have been throwing fits too. In fact I did when I was trying to attempt my sourdough. 😉 So do you keep the starter on the counter then? Does it stay safe that way? I’ve been raising kefir grains and they stay on the counter all the time. Fascinating how for years your starter was safe in the fridge and then just got tired of it. Yes, Kristy, you can keep the starter on the counter – I actually kept mine for the past week, then yesterday decided to dry some, inspired by Celia and Joanna – it is taking forever to dry, but it will get there. I spread it pretty thin on a parchment paper. At last, a reason for my loaves looking so depressed. Like you my descent into baking despair was slow and I made many changes of technique and ingredients with only limited success. Now thanks to you I have hope of a brighter and crustier future. It seems that my problem has been that Felicity who is now six years old has become unwell through being kept in the fridge between bakings, which due to domestic circumstances is only once every 10 to 14 days. I have had some limited success by feeding a portion of Felicity once or twice before baking but now she will be treated with much more care and kindness and has been put on your sourdough recovery programme. I will also freeze a portion to see how well that will work for me. Now looking forward with some real oven spring in my step. Aloha! When you say keep dough-consistency at room temp and refresh weekly, do you mean refresh once a week (not everyday) and at what ratio S/F/W (the same dough-consistency)? Then, if you pull out a frozen one and refresh daily, at what ratio? I think I have the same thing happening to my sourdough which is kept in the fridge but was more robust before I started keeping it there. according to David, you can refresh weekly at the dough consistency if you are not going to bake. When I refresh from frozen I go for a 80% hydration because I like that level… Hope this helps! Those loaves look beautiful! What a comeback! 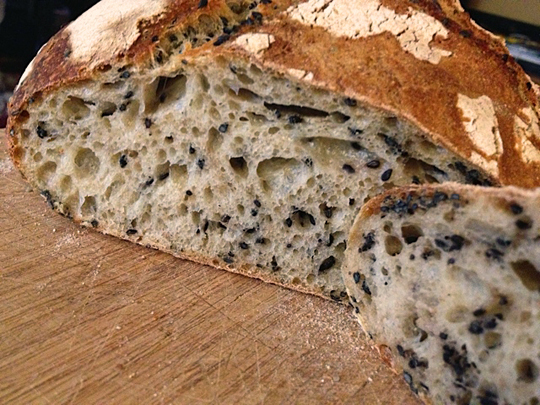 I might have to try the black sesame loaf next week. The information about how the bacteria react in the fridge is interesting, I’ve never heard of that before (clearly either my school cookery classes weren’t very good or I was too busy eating my ingredients to pay attention to the health and safety briefing). I never keep my starter in the fridge, unless I’m going away or we have a heatwave. I’ve never seen the need as mine has always bubbled away quite happily at room temperature. Thanks for the useful notes on reviving it though, I’ll be saving those in case I ever suffer a lethargic starter too. You kept your starter in the fridge and then took it out and fed it when preparing to bake. Did your starter seem alive, even though it wasn’t? I keep mine in the fridge and it seems to have no problem refreshing for a recipe, but maybe it is having problems? I guess I will have to try your refreshment program and see if I have better results. I too have been having for some years the same problem of tight crumb. I have followed Nancy Silverton’s method for white boules for 12 years. 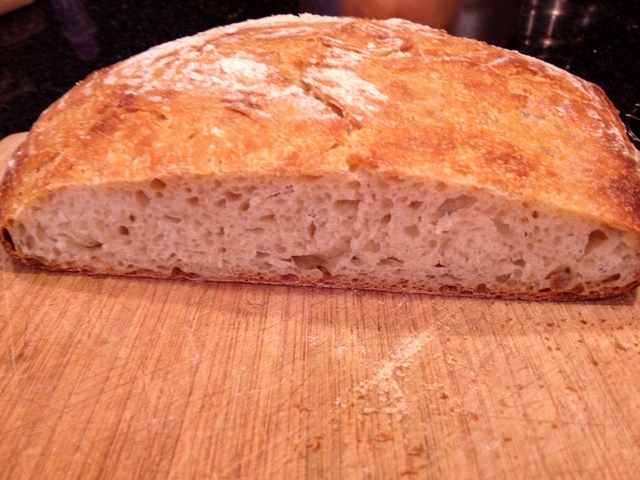 For the first few years my boules were great but some years ago I ended up consisitently with a pretty tight crumb. The taste is there and I am able by tweaking the temperature of the loaf at the time it goes into the oven (keep below 15C) to get a nicely risen boule but the crumb never looks anything like your beautiful photo. I have just finished trying to restore my starter firstly using the method David gave you and secondly by using white flour instead of rye to revive my starter but neither approach has made the slightest difference. I wonder if you use your starter fed on rye directly to make a white loaf or whether you feed it on white flour for a few days beforehand? Clearly Dan Lepard’s Handmade Loaf is a great book but the photo of his White Leaven slice on page 29 is no better than my disappointing efforts, I also am not happy about his approach which means having to be popping into the kitchen from 0800 till 1130. With Silverton’s method I start at a little after 0800 and by 0915 latest the bread is proofing on its own till about 1300. The only thing I can now think of trying is to start all over again to create a sour dough leven and though I think Silverton has as much knowledge as anyone I intend to buy the book Tartine Bread having learnt of it through your post and looked at it on Amazon and try to follow it precisely. Looks good. I’m going to try this. Have you considered or tried a retardation step in the refrigerator overnight instead of a room temperature rise?